Yulu-Burri-Ba Aboriginal Corporation for Community Health is responsible for providing a safe, friendly, confidential and culturally appropriate Aboriginal and Torres Strait Islander primary health care service in line with community needs and consistent with relevant National and State Aboriginal and Torres Strait Islander health frameworks. Yulu-Burri-Ba has clinics at North Stradbroke Island, Capalaba and Wynnum. At Yulu-Burri-Ba we love to expand our team and services offered to our community. Yulu-Burri-Ba Aboriginal Corporation for Community Health (Yulu-Burri-Ba) is responsible for providing a safe, friendly, confidential and culturally appropriate Aboriginal and Torres Strait Islander primary health care service in line with community needs and consistent with relevant National and State Aboriginal and Torres Strait Islander health frameworks. Yulu-Burri-Ba has clinics at North Stradbroke Island, Capalaba and Wynnum. Check back here for opportunities to join our deadly team. To stay in the loop also like us on Facebook! 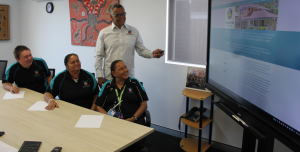 Yulu-Burri-Ba is a community controlled health service that provides primary health care and associated health services to the community of North Stradbroke Island and Brisbane’s Bayside suburbs. Our health services extend beyond a doctor’s visit as every effort is made to deliver innovative ways of working with the community to improve health outcomes. Yulu-Burri-Ba is currently seeking a highly motivated Family Services Manager to lead a dedicated team. The position is responsible for developing, expanding, monitoring and continually improving the specialised Social health, Family and Maternal and Child Health services delivered by Yulu-Burri-Ba in Brisbane’s Eastern Bayside region, as part of an integrated model of community and family-centred health care. Current health practitioner registration through AHPRA or eligible for registration with AHPRA, if relevant to your qualification.